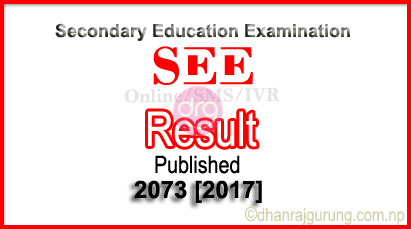 Today, 02 Aashad 2074 [16 June 2017], The Office of the Controller of Examinations (OCE) has published the results of Secondary Education Examination (SEE). 01. "GPA FROM 3.65 TO 4.00"
02. "GPA FROM 3.25 TO 3.60"
03. "GPA FROM 2.85 TO 3.20"
04. "GPA FROM 2.45 TO 2.80"
05. "GPA FROM 2.05 TO 2.40"
06. "GPA FROM 1.65 TO 2.00"
07. "GPA FROM 1.25 TO 1.60"
08. "GPA FROM 0.85 TO 1.20"
09. "GPA FROM 0.00 TO 0.80"
See the Notice image HERE for your reliability. Please submit your symbol number and then date of birth in table below to check SEE result for 2074. Note: If you have secured D/E Grade(s) in one or two subject(s), you can apply for supplementary exams. 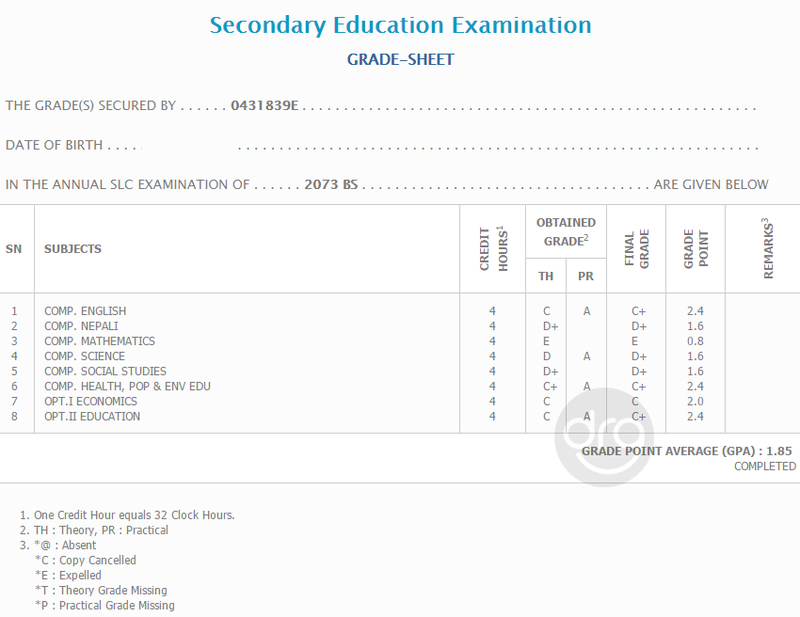 Eligibility to choose subjects after securing marks in SEE? शैक्षिक सत्र २०७४/२०७५ मा कक्षा ११ मा विधार्थी भर्ना सम्बन्धी आधारहरु - See Notice Image from DOE Nepal - HERE. 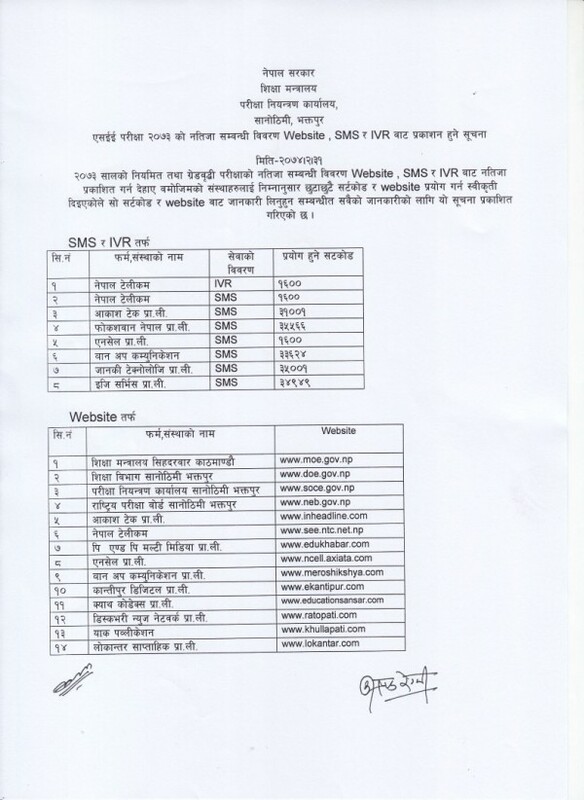 And also you can check the Revised Guidelines For The Enrollment Of Grade XI 2074/2075 - HERE. 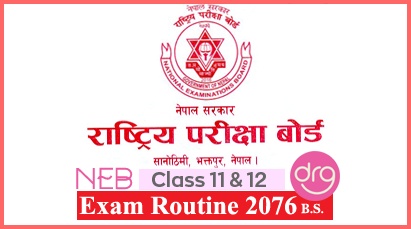 0 Response to "SEE Result 2073  Published | 2 Aashad 2074 | Check SEE Grade/Mark [Grade Sheet] | SEE GRADING SYSTEM In NEPAL"